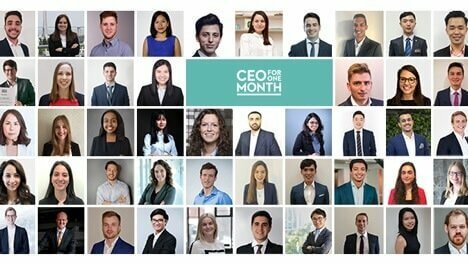 They are young, ambitious and eager to learn: 47 young ‘CEOs for One Month’ have been chosen by the Adecco Group from more than 200,000 applicants around the world. The ‘CEO for One Month’ programme gives young people a unique opportunity to gain the hands-on work experience they need to thrive in their careers, through training, work opportunities and internships at the top of a market-leading multinational company. The newly-appointed ‘CEOs for One Month’ will now take up their roles shadowing the Adecco Group national CEOs in their country of residence. After this first national stage, 10 shortlisted candidates will be selected to participate in a global boot camp in London in September to decide which candidate will work with the Adecco Group CEO Alain Dehaze as the global ‘CEO for One Month’. ‘CEO for One Month’ is an innovative talent attraction system that has provided valuable experience and job opportunities to over 180 young women and men around the world. Last year’s selected global ‘CEO for One Month’ – Ed Broadhead – has since taken up a role as Head of Data Analytics at the Adecco Group, while former Italian ‘CEO for One Month’ Ernesto Lamaina is now the founder and CEO of Adia, the Group’s recruitment on demand brand. Stay tuned for the top 10 announcement and the global boot camp in September!